(Phys.org) —Two college students (Shai Schechter and Andrey Kovalev) have launched a Kickstarter project aimed at bringing an easy to use and affordable 3D printer to the masses—one they have designed themselves. Called the Deltaprintr, the device is a novel pole based design that uses fishing line instead of traditional belts. By using an open air design (and fishing line) instead of the traditional Cartesian style box, the Deltaprintr allows for quicker printing (it eliminates the need for the print-head to perform unnecessary movements) easy expansion (the ability to print taller objects)—and for more easily performing leveling calibration (it's automatic in some instances), something that can't be said for most other 3D printers being sold. 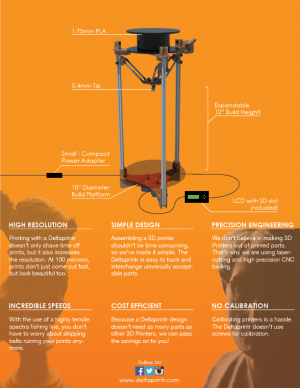 But what truly sets the Deltaprintr apart is price: one fully assembled printer costs just $675. Surprisingly, the low price doesn't mean giving up quality either—the Deltaprintr 's 4mm tip is capable of 100 micron resolution. 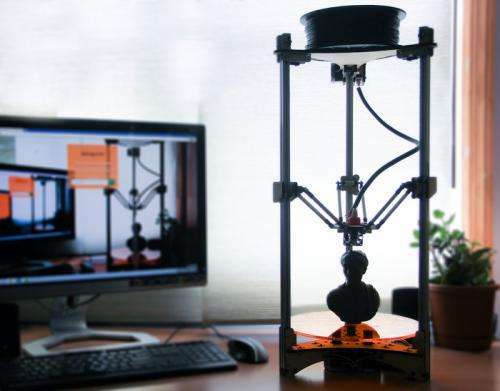 The printer in its default configuration allows for printing objects up to 12 inches high, but that can be increased by the owner replacing the fishing line with longer strands. Schechter and Kovalev also promise to allow for printing taller creations in the future when they will offer longer side rails. One drawback (though some may consider it a positive attribute) is that the printer only prints using 1.75mm PLA (as opposed to ABS plastic). The upside is that the bed doesn't get hot and create a burn hazard. Another attribute of the Deltaprintr is its simple elegance—watching it in action is reminiscent of scenes from utopian sci-fi movies where everything works easily and smoothly and in many cases, with grace. That perfectly describes this new type of printer with its print-head dancing in the air as it lays down layer upon layer of new material, creating, for the most part, works of art. The design has clearly captured the imagination of online visitors to Kickstarter—the goal of $195,000 has nearly been met, and orders have already exceeded initial expectations. What's perhaps even more promising is the prospect of even cheaper models in the future should sales grow to the point of allowing mass production.